Rather than adding flavour and calories through oils and fats, why not try using herbs, spices and unusual ingredients instead? It can be hard to know where to start if you’re used to using butter, cream and cheese to add flavour to your dishes, so here are a few ideas for adding lots of taste without the calories. Wasabi is a traditional Japanese condiment that’s perfect for adding a bit of a kick to meat, fish and vegetables. Made from the root of the Japanese horseradish plant, wasabi is green in colour (often because of additives) and comes in paste or powered form. Another idea for using wasabi at home for the more squeamish non-raw fish eaters is to mix the paste or powder with a little soy and use this as a dressing for steamed greens with noodles. Wasabi is also great with cold roast beef! Anchovies are a great way for adding flavour without calories to lots of dishes. Many people are put off using anchovies as they think they’ll add a fishy taste, but they really just add a deep savoury flavour. Try roasting salmon fillets in your oven on the hottest setting, with anchovies and cherry tomatoes (and a splash of white wine) in the roasting tin. Anchovies are also delicious paired with courgettes. Try grating the courgettes and frying them in a little bit of olive oil, lots of garlic and chilli and a tin of anchovies then stirring the mix through hot pasta. Ginger is a much underrated spice, especially as it’s great for digestion and packed full of vitamin C. Try it grated over fresh melon as a tasty breakfast or pudding. Ginger also works really well with prawns – try stir frying finely chopped ginger with fresh king prawns and add a little dry sherry, soy and plenty of chopped spring onions, then serving it with boiled rice for a quick and healthy supper. Don’t forget ginger as a drink too. It’s wonderful hot or cold. You can slice up some ginger and pour hot water over it, add a spoonful of honey and either drink it after a minute or two (very comforting if you’re feeling run down) or leave it to go cold and put in the fridge. 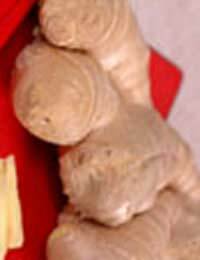 A good tip for storing fresh ginger, especially as supermarkets don’t always have plump looking pieces, is to keep it in the freezer. You can grate or chop it straight from the freezer and you don’t even have to peel it – although if you do want to peel it, try using a vegetable peeler instead of a knife so you don’t lose all that perfumed ginger just under the skin. Keeping a well-stocked spice cupboard, or even just a large plastic box, is an easy way to add loads of flavour with no extra calories. It also means that you can quickly make a healthy meal for the family by just buying some fresh meat or fish and vegetables. Try use black pepper as a spice in cooking rather than just as seasoning - it's great mixed with sea salt and flour and used to dust a chicken breast or salmon fillet before grilling. Chilli is also a very easy-to-use spice as it adds a kick to all sorts of everyday foods. Try adding dried chilli flakes to a tin of tomatoes and lots of roasted vegetables to make a delicious pasta sauce that you can also use to top bruschetta or stir through cous cous. Fresh herbs are the ultimate way to add flavour to your cooking - they're also packed with vitamin C. Try making a pocket with aluminium foil per person and adding in a piece of fish (coley, salmon and pollack work well) a slug of white wine and a handful of herbs (parsley, coriander, chives or basil are great with fish), seal the pocket and bake in a hot oven for 15 minutes. Another great way to use fresh herbs in your low calorie cooking is to make your own dressings. Shop-bought salad dressings have more oil than you need, so simply put a drizzle of olive oil, some salt and pepper, a little white wine or cider vinegar and a couple of handfuls of fresh herbs in a blender. You can vary the herbs and the oil for different flavours - try sesame oil with coriander for a great Asian-flavoured dressing that's great with noodle salads.